Kathmandu, 30thMarch 2015, Syakar Trading Company Pvt. 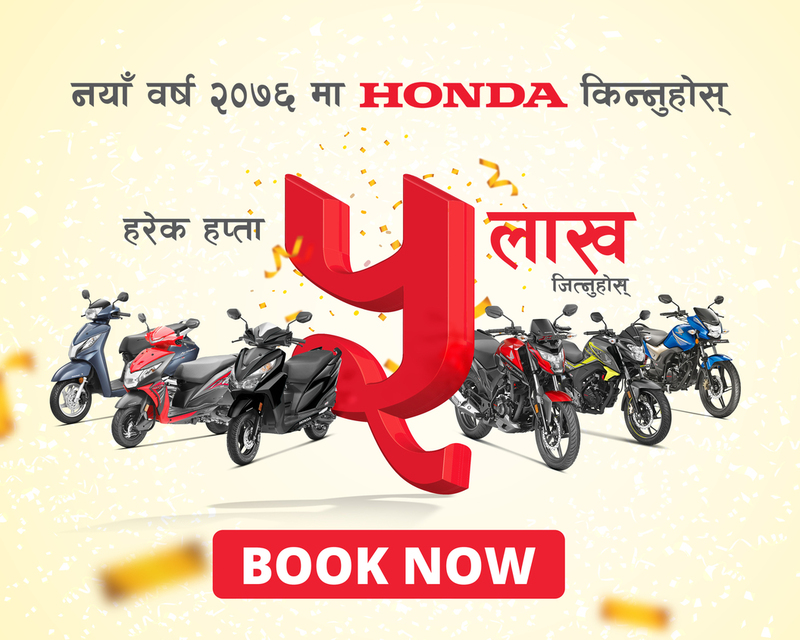 Ltd. (STC), the sole distributor of Honda Motorcycles for Nepal and one of the leading companies of Jyoti Group, has wished their customers to have a happy and safe New Year with its New Year offer “Naya Barsha… Subha Rahos, SAFE Rahos”.With this, they have also introduced various schemes in the market. Now, on the purchase of every Honda bike, customers can win scratch card worth Rs.4000 to Rs.1 Lakh. Moreover, every week, one lucky customer can also win cash Rs.1 Lakh through lucky draw.The company believes that with this scheme, now the customers will not only get the feeling of added safety with their Honda bike, but also win various cash prizes, making their New Year even more special. Syakar Trading Company Pvt. Ltd., has been doing motorcycle business ever since its inception and is one of the most reputed and leading companies of Nepal with its retail outlets spread all across the nation.